This piece was quite a challenge because of the process involved. It required techniques that were far different from that of our previous projects and therefore demanded more time and deliberation. 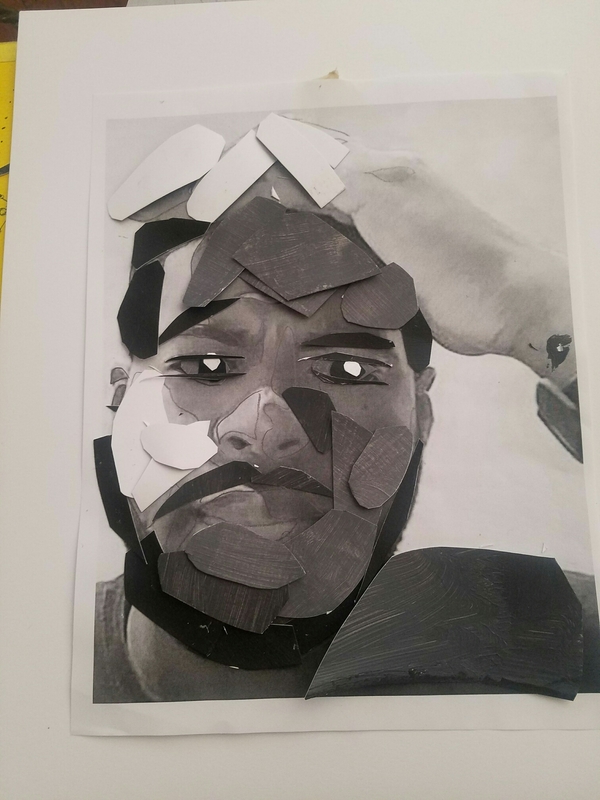 The tools used wss acrylic paint in order to create the values, scissors to create the varying shapes and sizes and a photo of myself to act as the self-portrait piece. The elements of design are certainly achieved because a nice balance of values are present and repition is involved. For my final assignment the three traits I’ve chosen were controlled, biometric shapes and visual texture. The tools I’ve used was traditional bristol paper 9×12 in dimensions, acrylic paint, tape and ruler. I approached this project with many of our past projects in mind, trying to incorporate elements that I’ve admired throughout our semester. Using paint continues to be a challenge because unlike with pencil and marker, there is far less control and precision using paint. Each part of my painting I believe represents my traits well all while incorporating the elements of design. I believe this piece succeeds because it creates an artful abstract image, however it may suffer from its simplistic execution. This piece represents my traits in very distinct ways. The lines and color gradation on the bottom represents control. 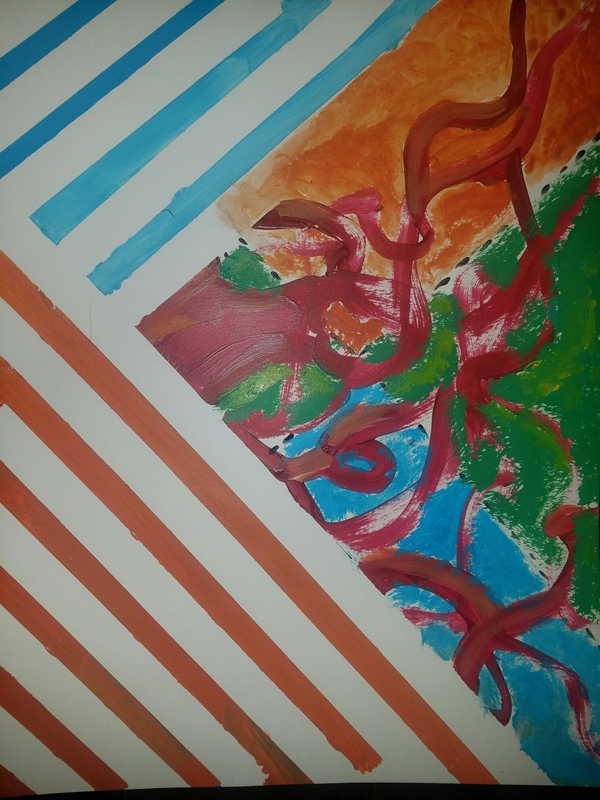 I measured the space between the lines so that they are all about an inch apart, then in between the lines I gradually added white paint to my mixture of orange and blue in order to create a neat transitioning effect. On the right side of the painting is where biometric shapes and visual textures are more clear. My intention was to create a abstract and emotional environment. The opposing blue and orange colors represent conflicting feelings, perhaps anger and sadness. The green in between the two represents happiness and vitality in life, that can exist between anger and sadness. I was mindful to incorporate much of the elements of design, color variation especially plays an important role in satisfying the traits I’ve chose. Negative space helps achieve my sense of control. Repetition is apparent, through the lines and color scheme. Contrast is present through the opposite colors used. Through the way I chose to organize my piece, a focal point and visual flow is present. All of this considered, my piece lacks craftsmanship to an extent. I didn’t post the piece onto a large border and some of the paint is streaked mistakenly, but the overall themes hold up. This piece involved textures. The selection we chose in class gave the the following collection of themes to utilize- Squares, black tape and rhythm. Upon starting I had a clear idea of how I wanted to proceed with the project. In terms of a focal point and visual flow, both are present and achieved. The focal point exists where the lines are in the top left of the piece. Visual flow proceeds from bottom to top and this is where clear lines have proved to be an effective tool. I’ve noticed that where the design fails is from the way in which rhythm is not truly present and there’s a lack of differing values. However the piece succeeds in terms of achieving most of the elements of design. There’s a lack of professionalism because of the blemishes found in the top left and right side of the piece. Within this project, variance of line is achieved through the use of a variety of drawing tools and techniques. The tools used was a PITT pen, standard pencil, sharpie and bristol paper. This piece was inspired by the fractals seen in lightning strikes and how the center streak of light is thicker and more dominant that the streaks that run from it. It lacks in a few cases, for instance, there isn’t much symmetry present, which makes the focal point unclear. Balance is also slightly missing since each corner of the piece differs substantially. I’d consider this piece unsuccessful. Although there are a literal variation of lines, the elements of design are not particularly strong enough. This project aimed to use varying thickness of lines in order to achieve the elements of design. My goal in this piece was to both achieve the elements of design as well as create a meaningful abstract piece. The tools used was Bristol paper, a thick sharpie, a PITT pen and a ruler. The focal point is clear in that it the eye is drawn to follow the lines towards the left portion of the piece. This is where the flow exists. Negative spaces aren’t explicitly present but they are used in a way that creates the figures seen in the center of the photo. I believe this piece succeeds because it uses the variance of lines in a unique way. However, it fails in that the piece creates too much of a clear image, and looks similar to a standard drawing. In this project my goal was to use lines, symmetry and curves to achieve the elements of design. Firstly, the focal point exists closer to the center of the photo where the curved “fingers” meet. The lines greatly help achieve this focal point. The visual flow also contributes to the focal point since the eyes are drawn towards to center of the photo as the flow continues. Repetition is quite clear because of the amount of lines used throughout the piece. I believe what could have been done to improve the artwork is the use of a tool that’d allow smoother curves, such as a protractor. Additionally, placing the photo on a larger bristol board backdrop would have given it a cleaner look. This piece succeeds because it accomplishes many of the core elements of design. Portfolio 1, focusing on photography, repetition and the grid consisted of a series of photos used to display all three attributes. The 12 photos I used were taken in a nearby wood and it displays the scene in a series of parts that make up a grid. Repetition is accomplished because each row is basically a single shot cut into parts, and this is easily noticed as your eyes move vertically along the piece. Materials used for this project consisted of my mobile phone camera, duane reades photocopying system, and 11×14 inch bristol paper. This is a portal into my 2D-Design process for this fall 2016 semester. Join with me along my journey towards a more defined artistic sense of 2D Design. 2-D Design Fall 2016 by Daniel Gardner Create a free website or blog at WordPress.com.